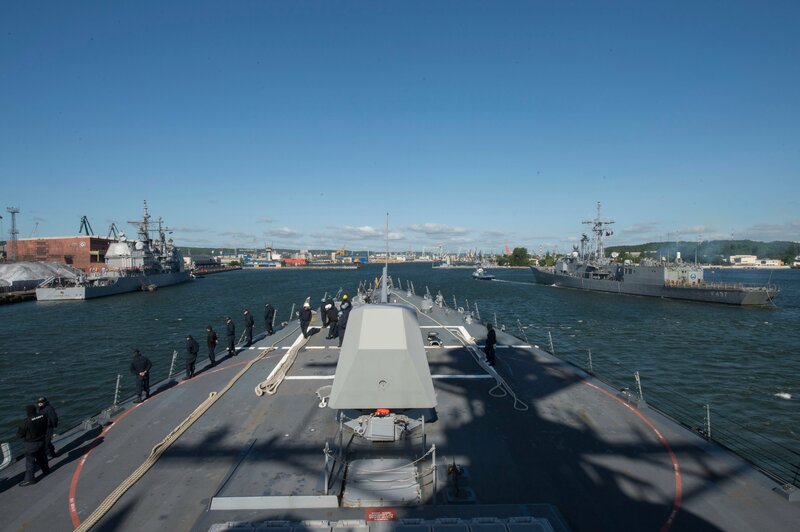 As 17 countries and NATO pulled out of the Gdynia, Poland, port together Monday to begin the 43rd annual Baltic Operations (BALTOPS) exercise, Russia sent its aircraft and warships to monitor the multi-phase exercise. Most of the 40 ships, 61 aircraft and one submarine left port Monday morning, and Vice Adm. James Foggo, commander of U.S. 6th Fleet and commander of NATO’s naval striking and support forces, said Russia made its presence clear. “Today during our formation steaming, shortly after we left port, we had some company from the Russian ship that was shadowing us,” Foggo told reporters Monday from the exercise’s command ship, USS San Antonio (LPD-17). Foggo said the Russian military had been invited to participate in past years and had joined as recently as 2012, but given declining relations with the West Russia has not been invited since then. Lowe added that the size of the exercise fluctuates from year to year and the focus should be on “the solidarity of the alliance” rather than on the size of the force that shows up for the springtime event. 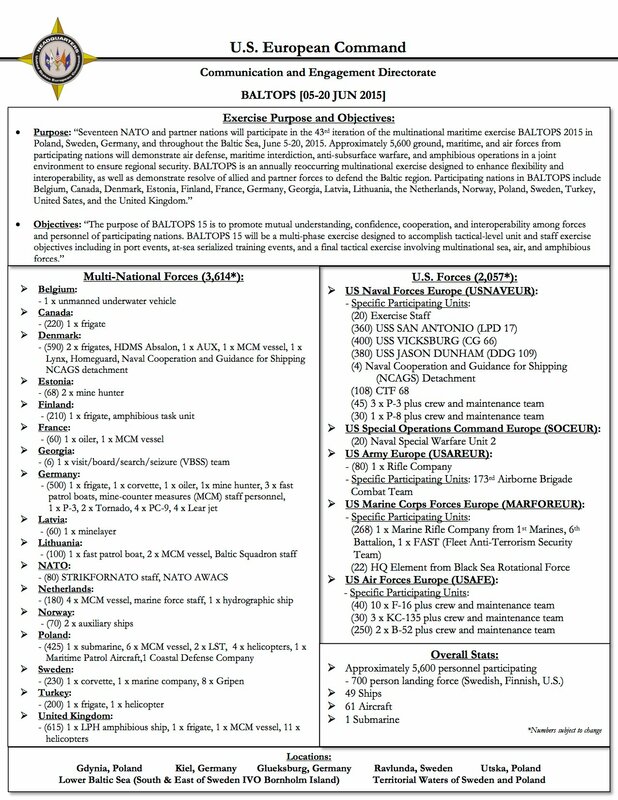 Fact sheet courtesy U.S. Navy. He added this was his sixth year participating in the exercise and, in addition to his first year being much smaller, it was “far more basic.” Over the years, he said, the partnerships have grown and NATO has established better maritime capabilities. “The interoperability we’re talking about, being able to talk to each other – not only in terms of the language but also in terms of our equipment and that capability – it’s about being able to operate together, understand each other” so countries can respond quickly and efficiently if a situation arises. Lowe said the 17 allies’ and partners’ militaries are constantly upgrading equipment and that “at the moment, the force is working well together,” as proven by the photo exercise in which all the ships maneuvered together in a tight formation. Foggo highlighted an upcoming amphibious exercise as a key test of that interoperability. Marines from Finland, Sweden, the United Kingdom and United States will conduct a beach assault from the sea with their own respective gear and communications equipment in a test of communications amongst the countries and between the sea and the shore. The exercise, which began June 5 and ends June 20, will include demonstrations of air defense, maritime interdiction, anti-submarine warfare and more. Foggo said a mine countermeasures and mine clearance portion of the exercise will be particularly important, given that there is so much unexploded ordnance in the Baltic-area waterways from previous wars.